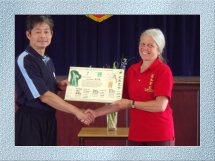 In 1993, I was given the gift of Qigong. It was an idea, a Way, and for me it seemed to bring together the beautiful aspects of all those hours of dance and meditation I used to do, into one practice. 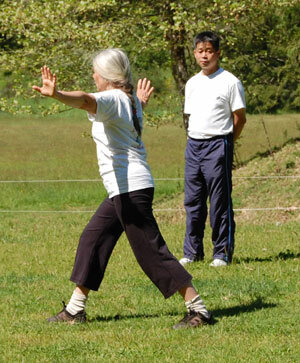 Yet Qigong was do-able in a short period of time with surprisingly delightful effects. It means a lot to me to know about my Qigong lineage and to know that my Tai Sigong, Grandmaster Yang Meijun, had such a long and healthy life and that her skills were received and are passed on to us with such deep respect by her student, Master Michael Tse, my Sigong. I love that Tai Sigong did not even begin teaching until she was over 80 years old! That has given me a sense of not having to rush and to let things develop naturally, as Sigong has often said to us. I love to imagine the Daoist monks of 1,800 years ago, high in the Kunlun Mountains in China, watching the wild geese and playfully imitating their movements. I imagine them grounding these movements into forms which would keep them healthy with strong immune systems and well-balanced organs and the effect of creating harmony and well-being. Their survival stresses were different from ours but the principle is the same. We are best when centred, flexible and relaxed and regular practise of Qigong gets us this way. Practising Qigong every day appeals to my sense of ritual - taking that time to become part of All Creation, moving as a part of it in a natural, gentle way, connecting to the external, the internal, my heart and my breath. I like the feeling of building up more Qi to store in my Dantian which will later nourish me. I feel to be on a sacred journey, helping to carry on this precious skill and I am both humble and grateful that I am able to help pass on this skill to others through my teaching. 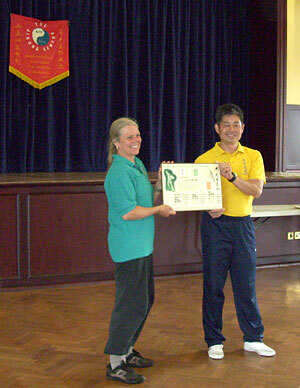 Qigong has given me the energy and courage to go through some very difficult times. We all face difficulties in our life, but Qigong has kept me well-balanced, helping me to move through life more clearly, easily and smoothly. Passing on this skill to my students is a great joy for me and I see that the more I teach, the more I also learn. Teaching helps me to grow and progress myself and to be better able to help others to shine more brightly in their lives.